At Home James, our chauffeur service is second to none and as we’ve been running now for over 10 years, we only provide a first class experience, tailored to your needs. Based in Bristol, we provide a local and national chauffeur service with drivers across the UK in all major cities. From executive travel and corporate events through to luxury wedding cars, sightseeing tours and airport transfers, no job is too big or too small for us, and we think you will find that our chauffeur service is unbeatable. At Home James all our chauffeurs are professional, punctual, discreet and smartly dressed at all times. They have all signed a confidentiality contract and are fully licensed, which involves a secondary driving test and a CRB check. Every chauffeur driven vehicle in the Home James’ fleet is top of the range, and all vehicles have to pass our 5 point safety check before the journey begins, because your safety is paramount to us. On your next journey why not try our professional, affordable chauffeur service, put the Home James guarantee to the test, and experience the difference for yourself. Depending on your travel needs you will be saving money , particularly when two or more passengers travel together.We offer one service, door to door. No need for parking problems at stations or getting wet waiting for a taxi. Our chauffeurs are there at your disposal, you will have no need to lift a finger. Need Transport To The Airport? Rest assure, you’re in safe hands. Covering all UK airports, seaports, coach, bus and rail stations, we can tailor your journey around your departure time. Our experienced team can advise you on travel times so you avoid any unnecessary waiting around or last minute panics ensuring that you arrive on time and stress free. On your return, we will welcome you in arrivals with a meet and greet name board and assist you with your luggage to the appropriate waiting vehicle. Here you can relax and enjoy the rest of your journey. So if you’re going somewhere nice this year, let Home James make it even more exciting! Attending An Important Business Meeting? With the Home James Business Travel service, we will arrive at your office or pick up point and chauffeur you to your appointment, so you can arrive feeling relaxed and refreshed. All cars have a laptop charging facility, if you need to work on the go, and in the larger vehicles, sit conference style to run through that important presentation before you get there. The daily newspapers and a range of refreshments are also supplied as standard. We believe our service is better compared to other forms of travel. If you take into consideration taxi fares to and from the train station at both ends of the journey, having to make the exact boarding time and no facility to go from meeting to meeting the costs soon add up and so does the stress of it all. Why not let us do all the hard work for you? At Home James we know how to turn on the style with our Corporate Service. 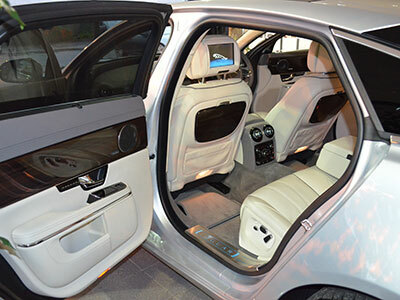 On collection our driver will welcome you and your party and invite you to be seated in one of our fleet of luxury vehicles where you will be presented with the daily newspapers and refreshments for your enjoyment during your journey. If you’ve had enough of the news, why not enjoy a film or sporting event from our extensive library of DVD’s from our on board entertainment system. On arrival to your destination, our driver will coordinate your pick up time and place, and will be waiting for you after your days event. On request we can provide a full buffet table, canapés, even champagne or any other drinks you may require for your trip home. At Home James, we know how stressful planning your wedding day can be, so take some weight off your mind and let us take care of the travel arrangements. We will provide luxury transport of your choice and to make it even more special, dress the cars in ribbons and flowers of your choice. We can also provide luxury transport for the other VIP’s that don’t get to travel in the main cars, making the day special for them too. If you’re worried about getting home after the evening celebrations, we can supply cars to shuttle the guests home, making sure all are catered for and home safe. Looking For A Reliable Courier Service? At Home James even your letters and parcels get special treatment. We have a network of cars all over the UK, so getting that important letter or package to its destination on time, safe and secure is not a problem for us. A Trip To Stone Henge Or The Bright Lights Of London? If you would like to visit some of Britain’s many famous historical sites or places of interest, then experience a Home James sightseeing tour. We will pick you up in one of our luxury vehicles, and you will be transported to your chosen destination. Our drivers at Home James are all experienced in sightseeing tours, from busy London to quaint fishing villages in Cornwall, the Welsh mountains or Stone Henge, anything is possible with Home James. Here you can take in the sights or be dropped off for a closer look around. For extra information during your trip, our onboard entertainment system can supply you with relevant interesting facts about the area.